Here are two original videos ChiIL Mama shot in January at Beat Kitchen. Enjoy! How Far To Austin is heading out to SXSW, to quite literally experience how far it is to Austin. 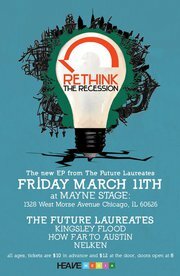 Before they go, Chi Town has another chance to hear them, live at the Mayne Stage in Rogers Park on 3/11/11. ChiIL Mama's got 2 pairs of tickets and 4 signed CDs for all the ticket winners. Enter HERE through midnight on 3/7. In case you're one of many Chicagoans heading down to Austin, these guys are playing The Iguana Grill on Friday, March 18th. Like what you hear? You can friend, follow and keep up to date with Tate and Katie and How Far To Austin's adventures in all the usual ways, via Facebook, Twitter, myspace, etc. We have many more music and theatre interviews, reviews, tickets to Chicago shows for adults and children, and great music and book give aways. So check in with ChiIL Mama like we vote in Chicago...early and often.